I remember sitting on the 10th floor of One Canada Square in London, the rain beating against the window, and thinking, “This isn’t what I want to be doing for the next 10 years”. I was 38 and working as a consultant in the finance industry. I’d previously been a commando in the Royal Marines and I think that training gives you an amazing sense of belief in what you can achieve. So I left London to work in a bar in the French Alps for a season, then came here to Gili Trawangan, a tiny island just off the coast of Lombok in Indonesia. I faced a lot of questioning when I jacked in the job. But I think in my own mind I knew it wasn’t really a risk — if you work hard, you’ve always got the ability to start anew. I started free diving by accident. I was working as a scuba instructor, and there would often be times I needed to dive down and do things without any equipment — to free an anchor, say, or to check the current. I really enjoyed the challenge and it became a question of “How deep can I go?” When I started researching techniques for holding my breath online I learnt what I was doing had a name — free diving — and that it was something you could do professionally. I went and did an instructor course in Thailand, and decided to open a school. Over the years I’ve added to it — there’s now a yoga studio and a vegetarian restaurant. 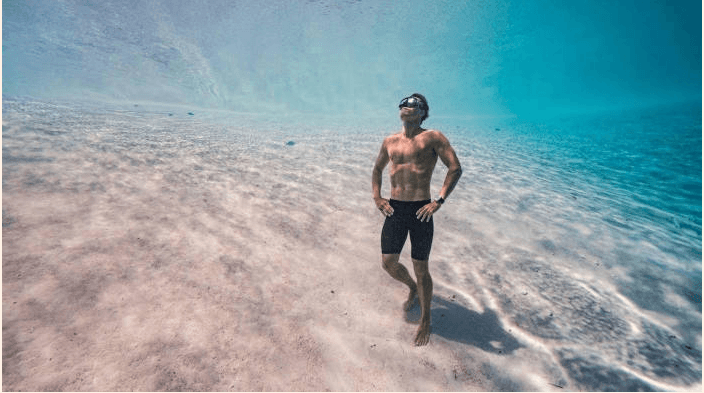 The basic set of skills for free diving really aren’t complex: you hold your breath and you swim underwater. It seems quite challenging because it taps in to one of our most basic fears, going somewhere you can’t breathe — but once you’ve got over that it’s easy. Then all you need to learn is how to swim using oxygen in the most efficient way. Out in the tropics we’ve got perfect conditions. You can learn to free dive to between 10 and 20 metres on a two-day course. Gili Trawangan is an interesting island. It’s 2km by 3km, with no motorised traffic — we get around by bike or horse and cart. It’s become a bit of a party spot since I moved here eight years ago so we get a lot of gap-year students, but the ones who walk into the free diving shop tend to be the more interesting people. I think that’s because the challenge of free diving is really internal. When you discover you can go down to 10 metres without panicking you’re so interested in what’s going on inside you that you’re not actually looking at the fish. Once you’ve mastered the technique you can go out exploring on a breath hold. The waters around Gili are full of tropical fish, turtles and reef sharks, and you can get up close to them because they’re not spooked by the bubbles like they are with a scuba. You’re part of the natural environment. When I’m not teaching I compete in free diving competitions. I’m 47, and in any other sport I would have stopped years ago, but this has actually been my best year: I dived to 108 meters and was in the world’s top five. By the time you get 100 metres down you’ve got an 11th of the volume of air in your lungs that you had at the surface. Some people talk about feeling a crushing pressure but I’ve always just felt totally absorbed — it’s a sort of meditation. I think marines tend to go on to do quite odd things, so I don’t think my friends from that time look at me and think I’m doing anything more interesting than the next person. At the end of the day I’m running a business, but I get to do it in a tropical paradise, not sitting at a desk in London.